Digital geeks often encounter a problem with making their business grow in terms of both good revenues and competing with brands. Just like everything is moving fast then before we need more automatic tools and techniques in computer science domain so we can save those plenty of hours towards more advancements. This article will cover best apps for web designers, along with the latest trends in application and their designing. We being human’s wants a virtual solution to everything rather than doing in manually adding extra hours to a simple work. Just like wheat from crops was picked first so then it was used to turn into powder to make a bread. Do you think we are living with same patience today where you can get this all done in just a few minutes? Similarly, we have witnessed same practices in the field of software development. This read is more about powerful strategies to Improve your Web Presence along with applications that help in achieving it. In today’s article, is more about Productivity Apps for Designers as this major part has a lot more concerns with users ease. 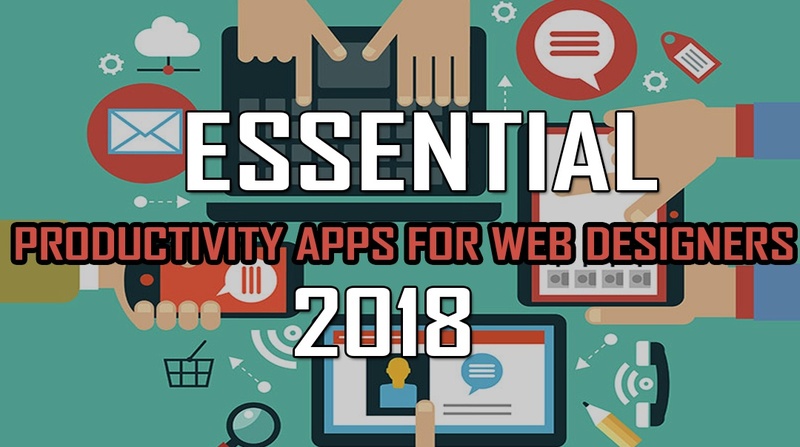 Here is the list of Essential Productivity Apps for Web Designers so they can automate their processes giving virtual applications that are advance, solutions. Before that, some of the best time tracking apps will be discussed that are generic in nature and are being widely used. It is a project management application that has a tendency to track everything starting from picture project to the in-depth details of an intricate plan. It allows you to organize your projects into creative individual cards, boards and sorting them into lists depending on the topic how much of it your topic needs. Another great feature offered by Trello is that one can share boards with members clients, colleagues allowing an individual to check the progress of the project while working remotely with having any contact with other people first. It helps everyone to stay focused, keeping the track of all does list to run plans effectively, by prioritizing them accurately. It is another project management tools that have been widely used to a digital tool that has been remote, across the multiple teams across the world. It also allows you to track projects and the progress of the projects till their finish. No matter if you are working in a team or remotely this fantastic tools helps you in doing your all detailed work in a productive manner. If you work in a remote team, where your colleagues are residing somewhere you feel that you really need a conversation with them, Slack provides you the best opportunity to do that. Slack is perfect for remote teams when the members are working in different time zone and in different countries. Teams can be made to do a group chat, after making everyone known about their online existence. All comments are instantly delivered and saved so that if someone logs into the system so a few hours later they can see the whole discussion with their colleagues accordingly. This is team management tool that was created with by keeping startups and tech on the way. Today Monday.com has more than 200 different verticals and has tremendously grown its network-wide as non-tech companies have also said it to be the one that was waiting for. Monday.com is a board for tracking that promotes transparency and collaboration among team members. It offers transparency in every operation by customizing and building a firm channel to communicate. Taiga is basically a project management platform that satisfies all needs of the large or small team. It targets teams that have agile mythologies for developing their projects. It is free and open source platform that gives you complete control over your project. It is incredibly easy to use and tracks workspace stages. It has Kanban boards in it that is highly effective in use. Boards Mason could always be described as the digital product or assembly app. Although there are plenty of design application in the market that offers users with this building block approach to websites or the application Mason took this assistance to the somewhat radical path. It deals with all digital products and the features. It gives the Best Web Design Tips along with enhancing the charm of your digital appearance of the product. Mason break all digital product into small or granular atomic parts and modifies only those parts that resemble everything. Here team has not to worry about the mockups and the prototypes of the build product. Instead of this they can now manipulate and deploy all features on demand. Mason allows designers to easily manage their business-related tasks and help with images and buttons without designing anything in the complex. It is free to use and helps the end user to view all changes with a simple set of events. Planning, tracking and managing employee time according to task was never so been easy before. Click time is a productive application that improves project visibility by controlling its budget, time and number of working hours are performed. This application has expenses to manage and has to time off to see who is available to perform a task or to work. The active collab is an efficient application with effective team collaboration keeping files related information in one place where it is accessible to everyone. Not only this but this helps in keeping files, feedback information, and relative information by structuring team in a meaningful way. Active collab does everything in a collaborative manner reducing the efforts of maintaining the bulk of data. Listed below are the application that can help you balance your budget while working with applications development stress. RunYour meeting is based on the principle that wasting time means productivity lost. As such it provides a solution to project leaders from worst nightmares that the team members, are not actively participating and not well prepared. This also helps in preparing and conducting and tracking the updates and to do list. It ensures that whatever you plan should get accomplish with inaccurate time. Should Futuramo visual tickets and is the easiest way for designers to receive their feedback on all digital projects. Teams can exchange and annotate screenshots while uploading images and skipping long issue descriptions. This application also offers an extensive and detailed set of features that allows collaboration on projects and managing user management, tickets management and advanced filters for organizing work-related tasks. It has advanced filters that help in smart filters, smart search and furthermore seamless threads for better collaboration. Listed below is the list of collaborating tools while working with the application at the designer end. Nutcache excels at sorting things so that they will stay safe and can easily be fetched and accessed whenever needed. This is basically a business-oriented agile based project management tools that are typically dedicated to helping creative teams, focusing on the things that matter the most. Nutcache manages all project’s complete lifecycle while according to the agile working mythologies helping designers for better collaboration. It is freelancing application platform that serves as an hourly basis and tracks the number of hours worked. Toggl is relatively a simple application specifically designed to track your time. One can set up its individual task and measures the productivity done so far by complete traceability of work events. You may look for an application that can offer you a complete solution and give you all required listed traits. Any of these application listed can definitely make your worth work doing. It can make you whole work easy to manage with complete control on project activities. Some of these applications are best for project management and the rest focus on the team collaboration and some of them serve both purposes. It is a very common practice that increases your productivity. There are companies that are providing software development services with best front end designing. Along with web application development they are now strengthening their network and working on Better Future with iOS App development Services as web all alone is not enough to facilitate us.